During Christmas vacation, my sister and I tried to bake vadai's with the electric donut maker. We just used the regular vadai batter with no baking powder or soda and did not achieve the results that we desired. They tasted like vadai,but, as they say in chemistry it was colorless. Apart from that they took forever to bake. So, I gave up on the idea of using the electric donut maker. A month ago, I was looking at a whole bunch of baking trays and it suddenly came to me that I could use a donut baking tray to make vadai's. This time, I started to think through the recipe before I blindly baked the vadai's. 1. The suggested temp of 375 F does not work well with vadai's. I think baking it at 375 F and then removing them out of the donut tray and baking them on a regular tray at 400 F created a crunchy exterior while cooking through the interior of the vadia. 2. 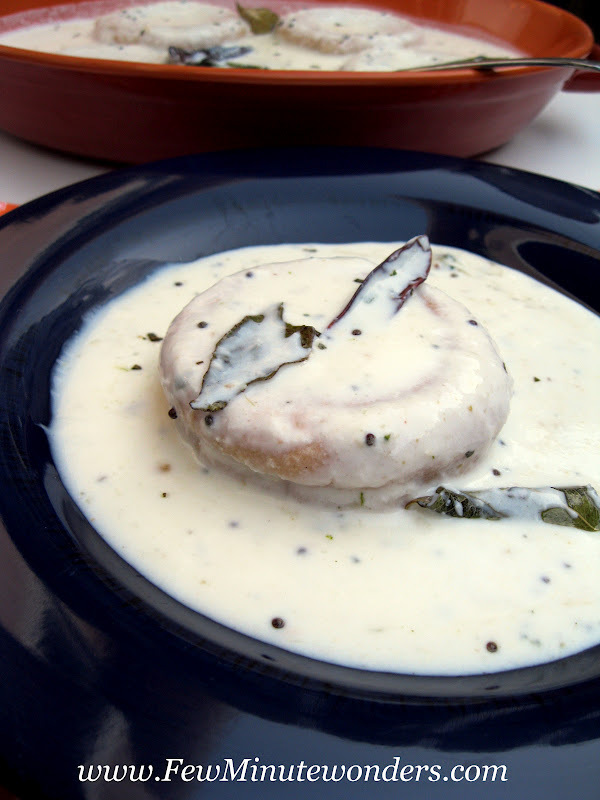 The regular vadai batter creates very dense vadai's and addition of some water makes a lighter vadai. 3. Baking powder and soda, do have a great effect on the cosmetic look of the vadai. They help in giving them some color. 4. 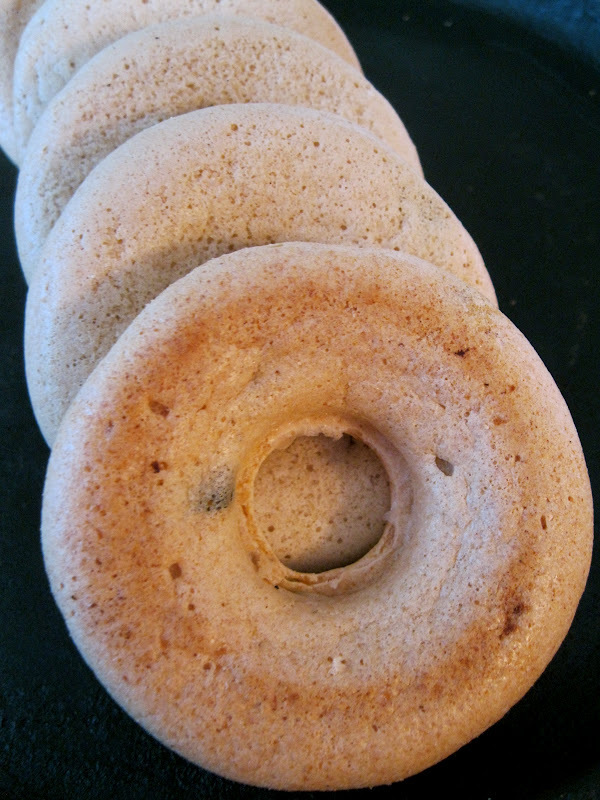 The donut pan creates a perfect shape for the vadai. The top inflates beautifully while in the oven and then deflates as it continues to bake creating a flatter top (which did not look pretty). With all these changes I was very excited to taste the baked vadai's. The vadai's came out crunchy and tasted fine with chutney when they were warm. Would I make it again? Sure! I loved the vadai with chutney, as sambar vadai and thair vadai. Seriously, you cannot tell the difference. I gave them to the pro's who are very picky about the their vadai, and they had no clue that they were baked. When I told them it was made with baked vadai, they suggested that I make it every week. Apart from the taste, was it safe to eat and was it digestible? Yes! they baked perfectly and no one complained of stomach ouchies. Now, one may ask why bake them? Why not? It is low in fat, people who have health issues and cannot have fried food, are left with very little choice to eat when it comes to Indian deep fried snacks. This is also a perfect and delicious alternative for people who are on a diet. It gives them great pleasure because it is guilt free eating. 1. Soak the udad dhal for 5 hours. Using a food processor, grind the vadai with green chillies, salt, asafetida, curry leaves with very little water. Keep sprinkling some water when needed. Note: 1 cup of udad dhal = 4 cups of vadai batter. 2. Set the oven at 375 degrees F.
3. In a bowl add the vadai batter. Add rice flour, oil,baking soda and powder. 4. 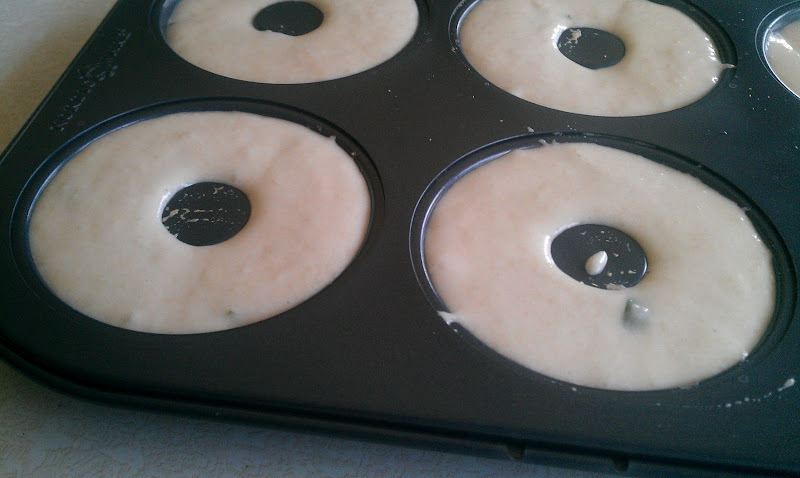 In a six regular sized donut pan, add about 4 tbsp of batter so as to cover the mould fully. Bake in the oven for 15 minutes. Use up all the batter before going to the next step. 5. Increase the oven temp to 400 degrees F. Place the vadai's in a baking tray and bake them all for about 20 minutes. 6. 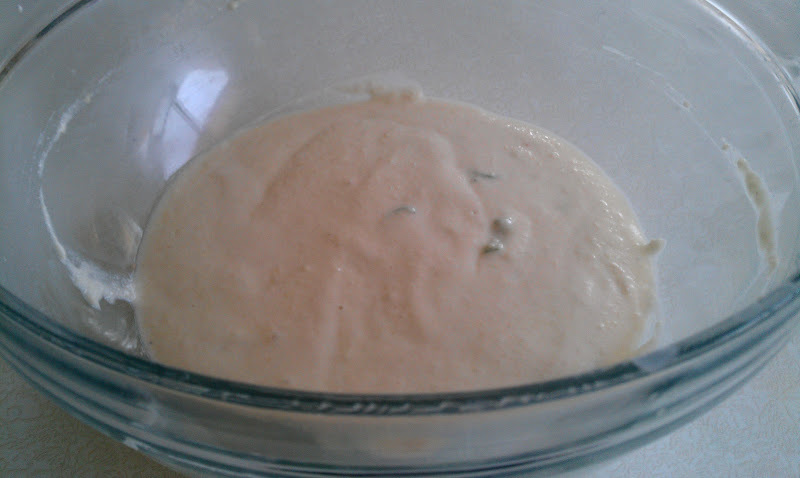 In a blender add coconut, and some yogurt, curry leaves, salt and blend. Mix it with the remaining yogurt. 7. Place the seasoning wok on medium high add 1 tsp oil. Add asafetida, mustard seeds, dry red chillies and curry leaves. Allow for the mustard to pop. Add this to the yogurt and mix well. 8. 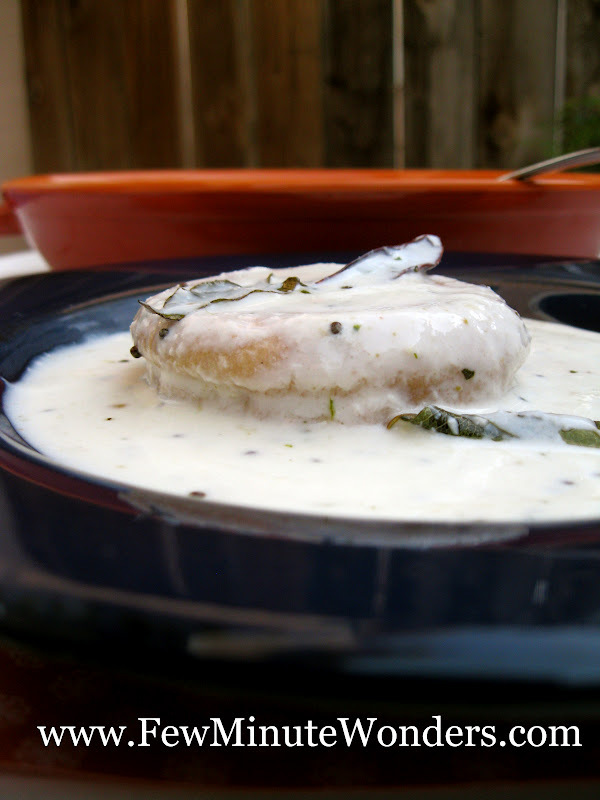 Dunk the vadai's in a bowl of hot water for a few seconds. Remove and squeeze excess water and place in a tray. 9. Pour the yogurt mix on top of the vadai's in the tray. 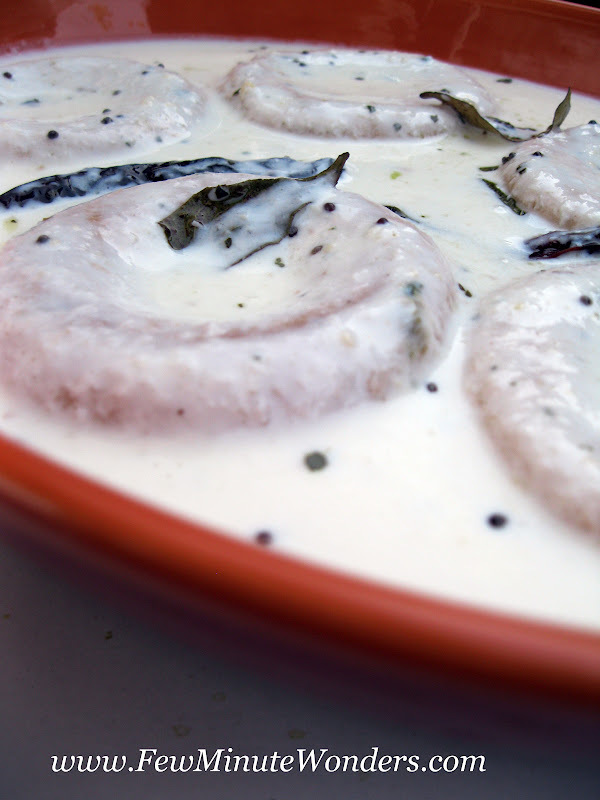 Allow to soak for sometime in the fridge and serve them chilled. This is indeed lovely my dear..:)) I love the idea of making vadais in donut pan..
What can be more tempting than this..
Never seen donut baking tray here, guilt free lentil donuts looks fabulous..prefect snacks for hot summer days. Super idea. And the title reads like a dish in a star hotel menu card!! The pictures are great. I didn't like donuts that came out from the electric donut maker, but recently bought the donut baking tray, and I also was thinking about this baked vadais..
What a coincidence Srimathi. 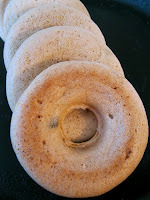 Loved your version of thayir vadai, baking it in donut pan is such a lovely idea. Next time, I am surely going to try this. If you like my work please like on facebook. Never heard of baking.. read about how sadhana made it on span & now this.. wow! they look so beautifully shaped and such a guilt free one! wow..yummy vadas in perfect shape! 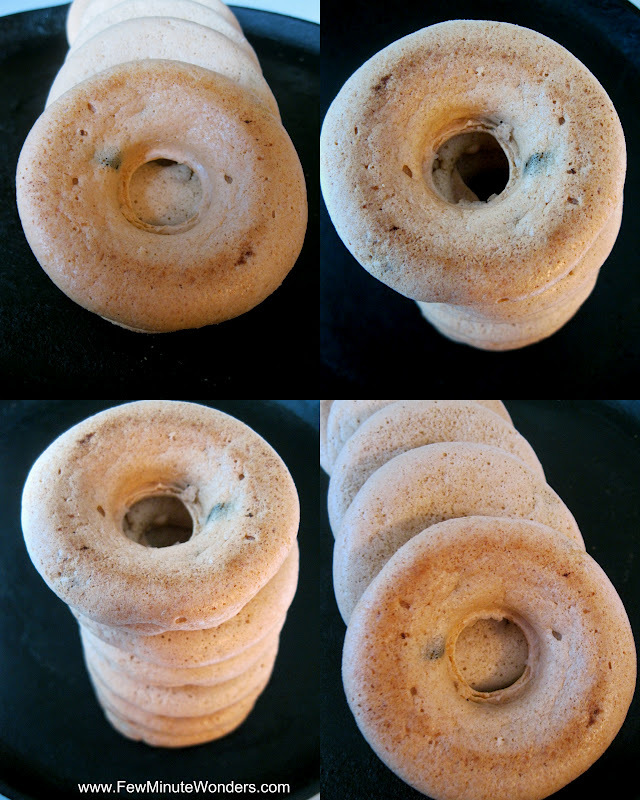 !Baking in donut makes it easy I feel,lovely invention!! very interesting...baking vada in donut tray! Nice idea n looks so beautiful, well shaped,guilt free n delicious too...Great job!! Never thought of baked version. Looks great. Your vada mix include rice flour. Have u tried baking with ulunthu vada original recipe.. Did it turn out..l i am gonna try it cos hate the amount of oil soaked in the original vada.. I have not tried it without rice flour. 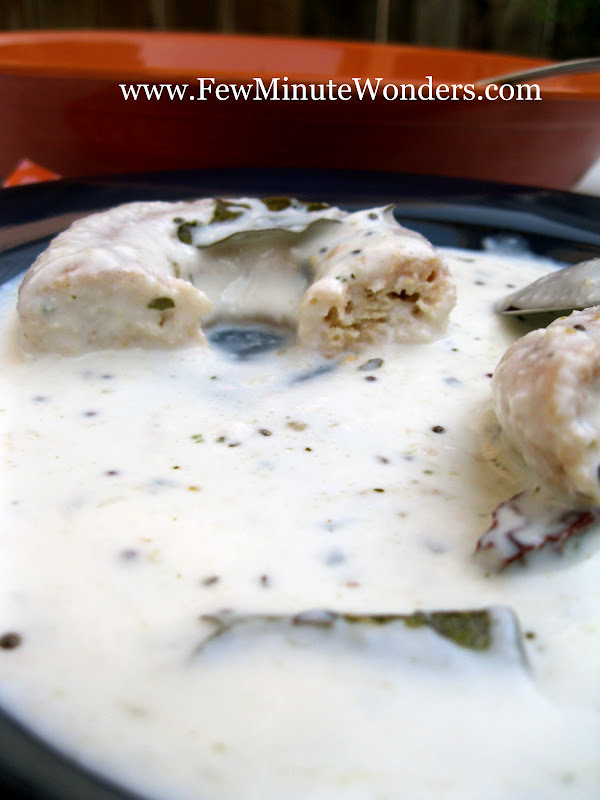 Most recipes add a tsp or two of rice in regular vadai preparation. I have not made vadai without rice flour as it adds a crisp texture to it. Please do try and let me know how it turns out.